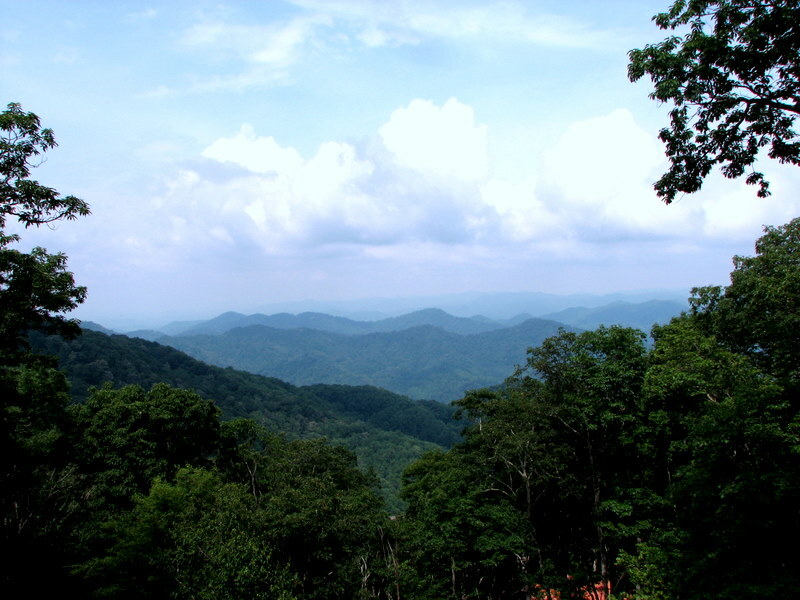 On our way home from Williamsburg, Virginia, in 2007 we traveled part of the way along the Blue Ridge Parkway. We chose that route so that we could visit some waterfalls along the way. 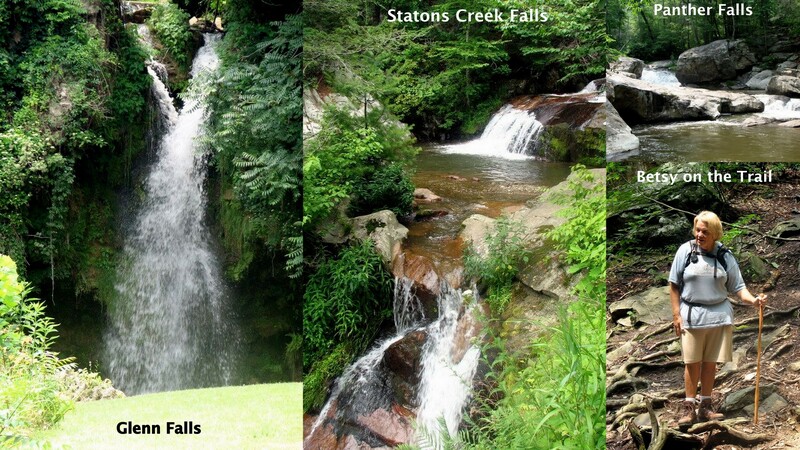 Summer is not a great time for waterfalls, especially if they are small and there hasn’t been much rain. But the drive along the Blue Ridge is beautiful any time of the year and the hikes to the falls were through beautiful woods and along pretty streams. It may have taken us longer to get home by taking this route, but it certainly made the trip more enjoyable. To see these pictures and others, click HERE. James River, Shirley Plantation, Virginia. June 23, 2007. 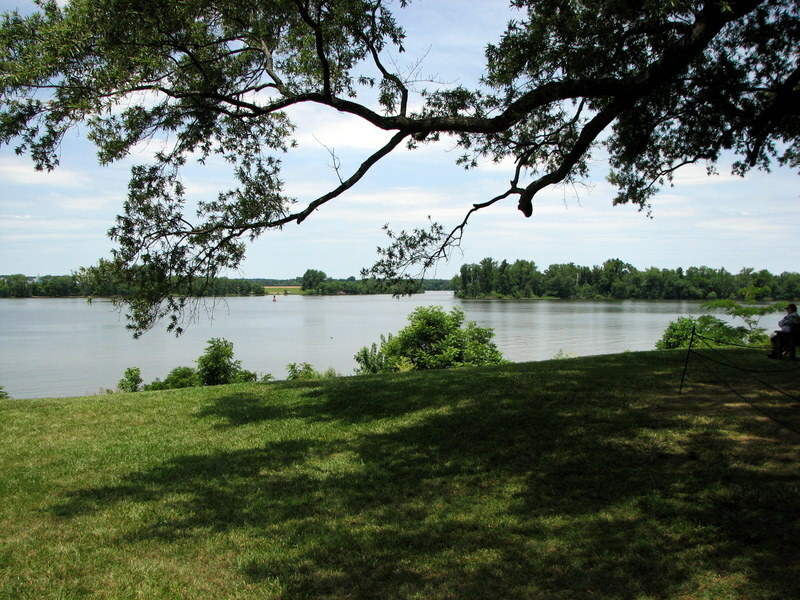 This picture of the James River was taken at Shirley Plantation in Virginia. Shirley Plantation was one of Virginia’s first plantations, founded in 1613. At that time the James was the great transportation route of Virginia. The first English settlement, Jamestown, was founded on the banks of the river, and the early plantations had their own wharfs to handle ships carrying both passengers and cargo. Ocean-going ships could navigate the James as far upstream as the present-day Richmond. 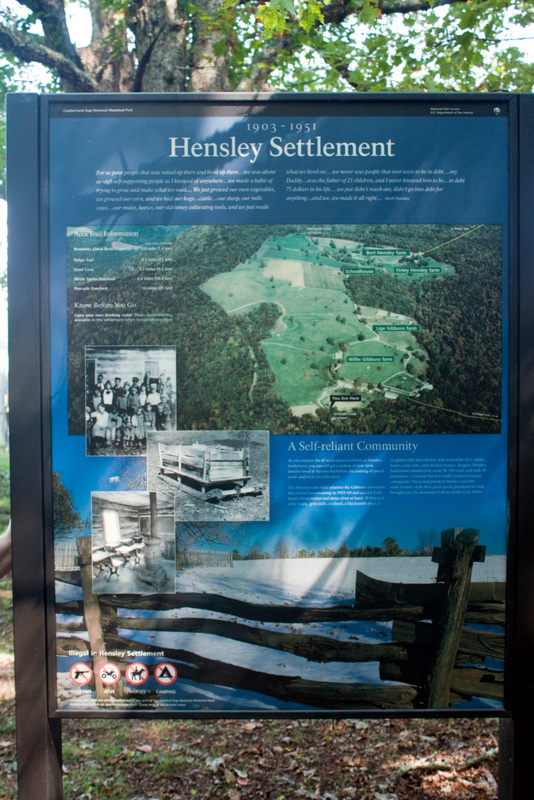 Sign at the entrance to Hensley Settlement on Brush Mountain, Cumberland Gap Historical National Park. September 23, 2010. Last week Betsy and I went to Kentucky to visit some places we’ve long talked about. On Thursday we went to Cumberland Gap National Historical Park in the mountains where Kentucky, Virginia, and Tennessee come together. The first thing we did was take a tour of Hensley Settlement, a community that existed from 1903 – 1951 atop Brush Mountain. We were driven to the settlement in a Park Service van along some ‘interesting’ mountain roads. Once we got to the settlement, we had a walking tour through the community and into some of the buildings. 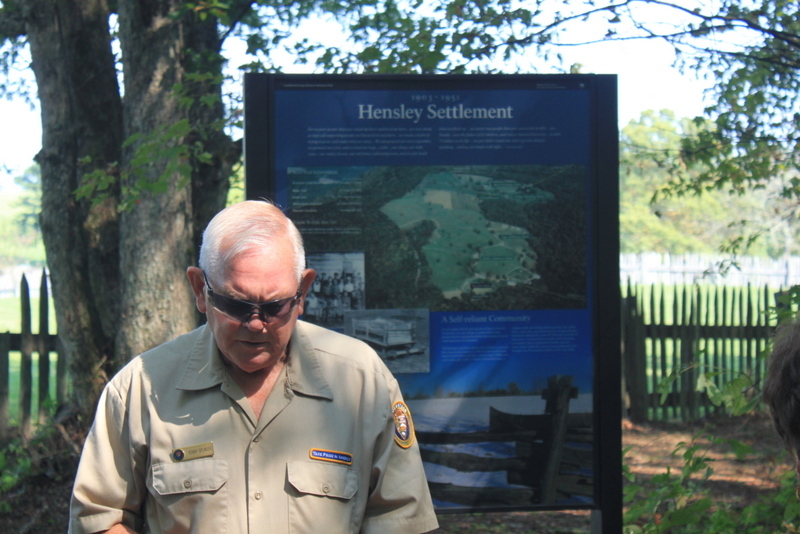 Our guide through Hensley Settlement, Ronny Oplinger, the grandson of one of the founders of the settlement. September 23, 2010. The guide on the day we were there was the grandson of one of the founders of the community. It was definitely interesting to hear his family stories as we walked through the community. The Lige Gibbons Farm, Hensley Settlement. September 23, 2010. 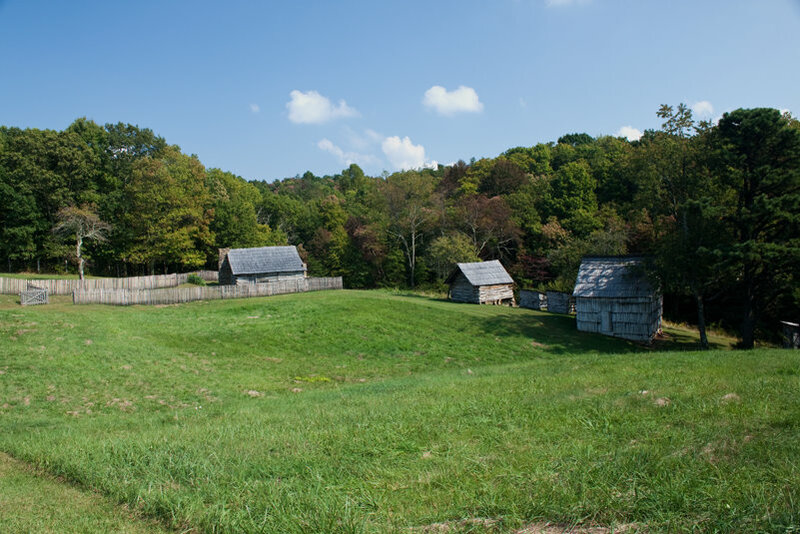 The Lige Gibbons Farm is one of the preserved homesteads on the mountain. This farm is in a pretty little hollow on the mountain top. 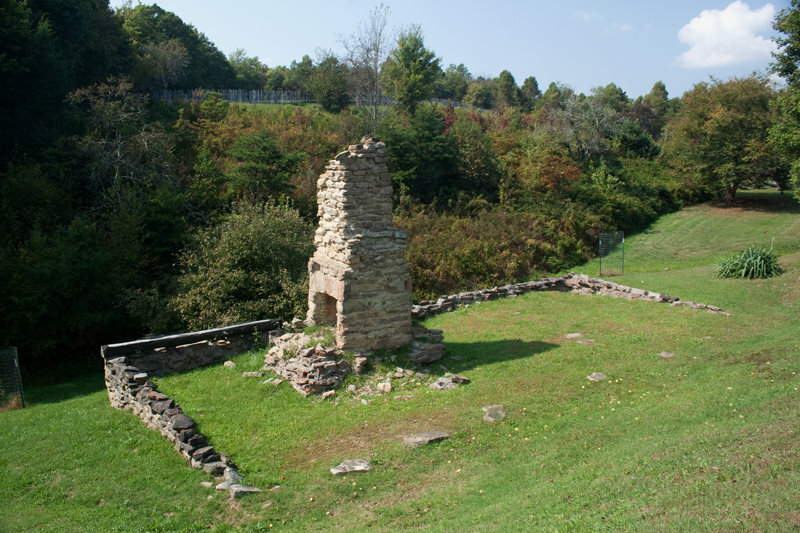 Ruins of the Willie Gibbons House, Hensley Settlement. September 23, 2010. Unfortunately, preserved doesn’t always mean protected. This is the ruins of the Willie Gibbons house. It was built in 1904 and was the most unique cabin on the mountaintop. It was larger than most and had a double fireplace. Sadly, it was destroyed by fire in 2000 and there are no longer any American Chestnut logs big enough to rebuild it as it was. There are many more things to see in Hensley Settlement and I will post more after I get through some of the pictures we took. 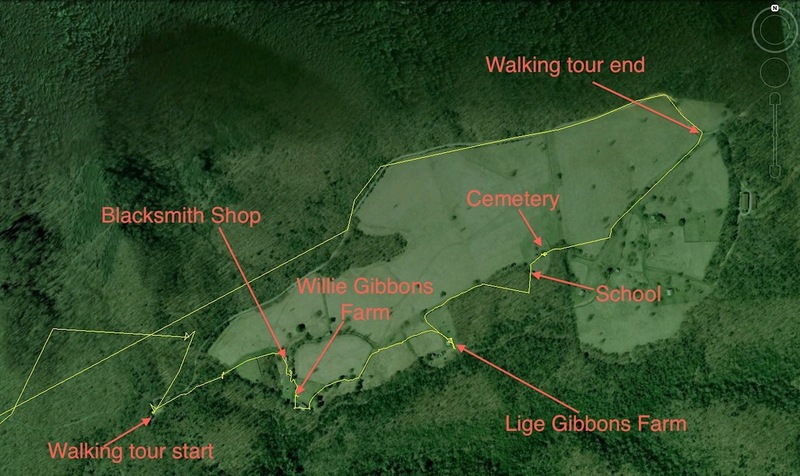 The map above of our visit to Hensley Settlement was created on Google Earth using data from our geotagger. The yellow line is our track, and I’ve noted some of the main features of the settlement. If you ever get the chance to visit this site, I urge you to do so. I think you will enjoy it. Rainbow at Cumberland Falls State Park, Kentucky. September 25, 2010. Betsy and I spent a couple of days in Kentucky enjoying the beautiful scenery and doing some hiking. We first went to Cumberland Gap National Historical Park, where Tennessee, Kentucky and Virginia come together in the mountains. We visited a historic community, enjoyed the view from the Pinnacle, and hiked along the Wilderness Road. The reason we went to Kentucky when we did was we wanted to see the moonbow at Cumberland Falls State Park. 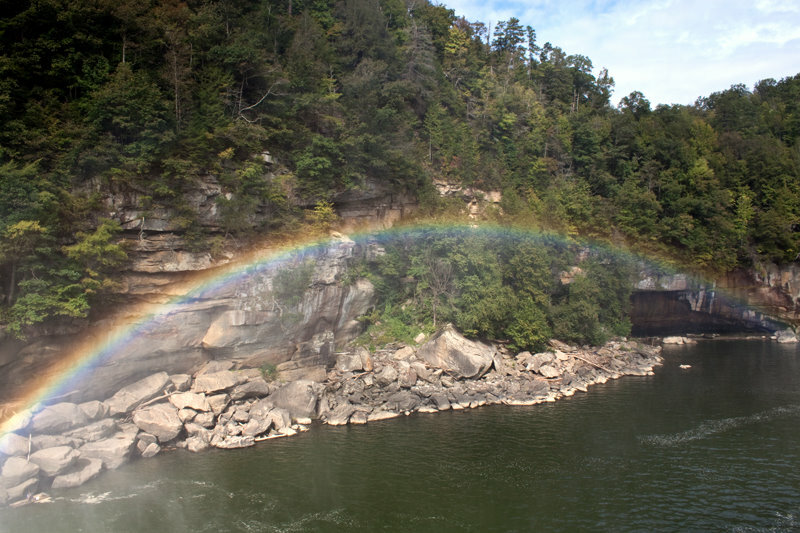 Cumberland Falls is one of two places in the world with a predictable moonbow. A moonbow is a rainbow produced by the light of a full moon hitting mist rising from the base of the falls. In order to get a moonbow, the moon has to be full and the sky clear. As luck would have it, we were at Cumberland Falls on Friday night — a night with cloudy skies and a few sprinkles. There was no moonbow that night, but we will probably go back in the future to try again. Even though we did miss out on the moonbow, we did see this pretty rainbow when we visited the falls the next morning. That was impressive enough to make up for the lack of a moonbow. Betsy and I rarely travel anywhere without working in a few visits to waterfalls. In August of last year we went to Florida to see Betsy’s brother and to celebrate Betsy’s birthday. Along the way we stopped near Turners Corner, Georgia, to visit four waterfalls that we found in one of our waterfall books. The first waterfall we saw came as a surprise. We found Trahlyta Falls when we rounded a curve and saw it through an opening in the trees along road. We got a pretty good look at the falls from the side of the road, even though it is actually in a state park. We decided to settle for this view rather than enter the park and hike. There were two waterfalls along Waters Creek. The first (Lower Falls) was on private property and we couldn’t see it very well. Getting to the main waterfall involved a drive along a Forest Service road. Those roads are always a challenge, but our faithful Prius handled it without any problems. The last two waterfalls involved a very pleasant hike through a woods. There wasn’t much water going over either Middle or Lower Desoto Falls, but they were both worth the visit. 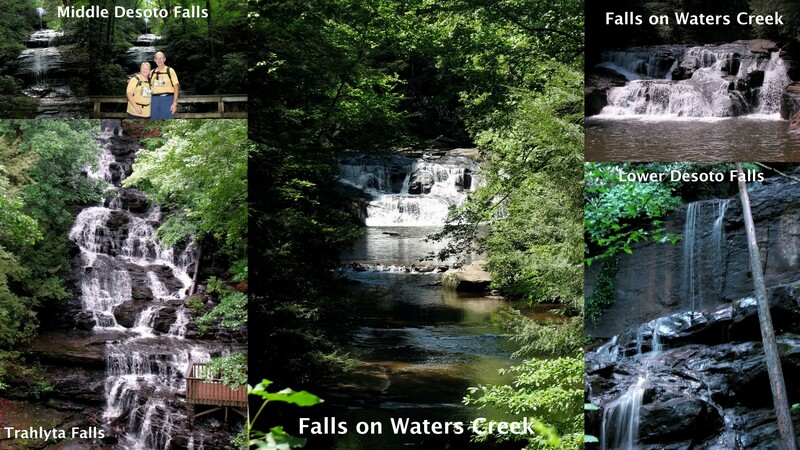 To see these pictures and others of the waterfalls we visited, click HERE. Hurricane Falls, Tallullah Gorge State Park, Georgia. June 23, 2009. Hurricane Falls is one of the major waterfalls in Tallulah Gorge State Park in Georgia. It is the waterfall that a visitor can get closest to, but getting close involves a hike down 600+ steps from the rim trail. And after enjoying the waterfall there are the same 600+ steps back up to the rim. But the steps were worth it in my opinion. 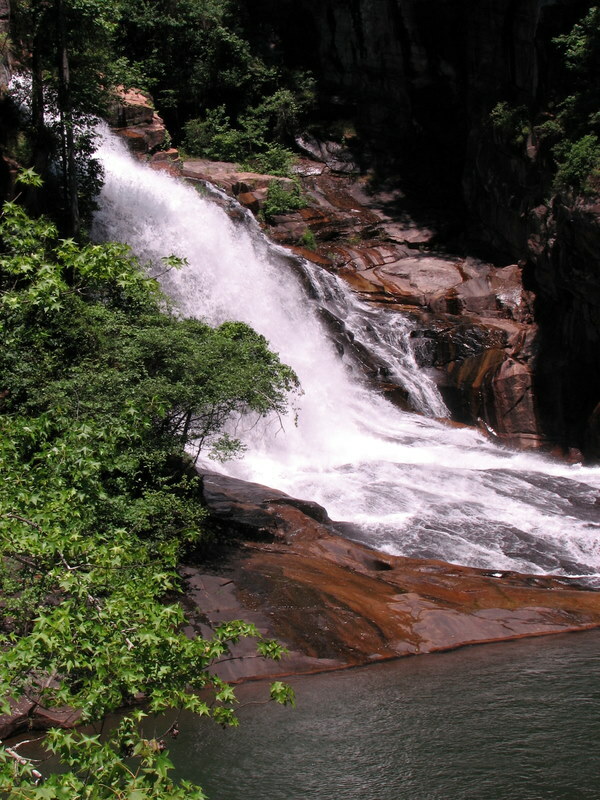 This picture was taken during a June, 2009, visit to Tallulah Gorge. Berries on our dogwood tree, Fairfield Glade, Tennessee. September 15, 2010. This has been an exceptionally hot summer here on the Plateau. The record number of summer days with temperatures over 90° is 78, and we stand at 77 with two more days of summer left and highs around 90 predicted for both days. But there is hope. 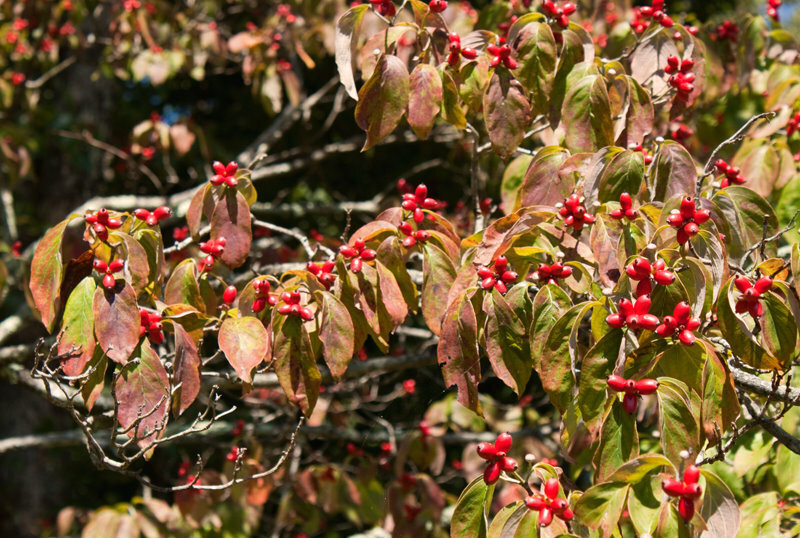 The dogwood tree in our front yard is now sporting berries, a sure sign the autumn is on the way. 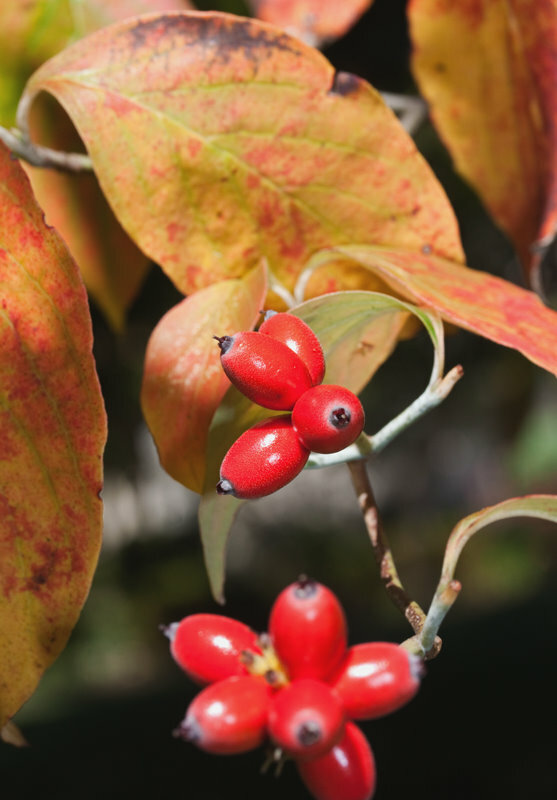 The berries are a bright red, and although the leaves are trying to turn, there is now only a hint of color. Leaves starting to show some color. September 20, 2010. But hopefully they will turn and give us more color. And hopefully we will also get some cooler weather in our part of the world. The mountains of western North Carolina, Burnsville, North Carolina. July 11, 2009. Although Betsy and I go to the beach each year, we really like the mountains. I guess that’s a good thing since we live in eastern Tennessee. The mountains in the picture above are in western North Carolina. This picture was taken in July near Burnsville, North Carolina. Fairfield Glade, Tennessee. September 12, 2010. This past Sunday was absolutely beautiful here on the Plateau. 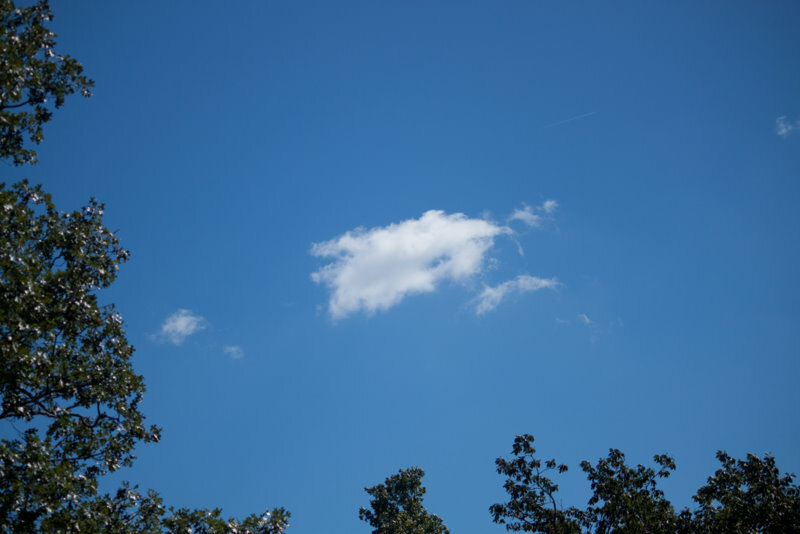 The temperatures were fairly cool, we had gotten some rain on Saturday, and the sky was a gorgeous blue. 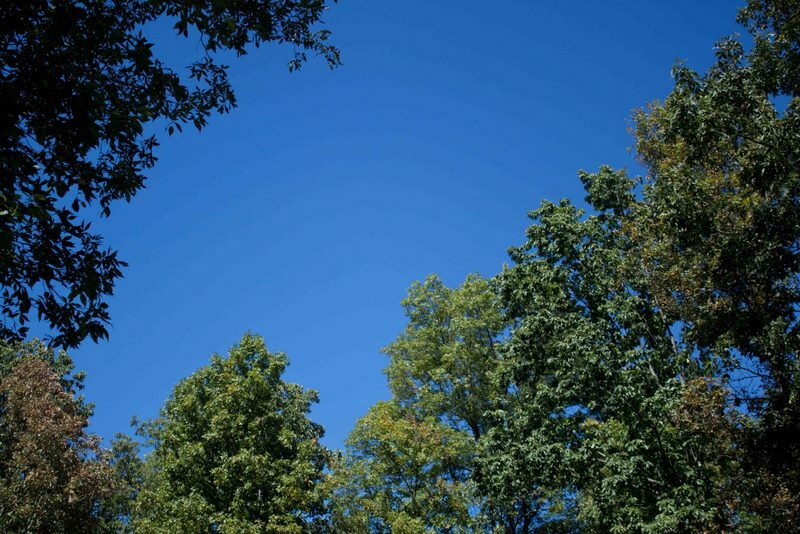 When I lived in North Carolina we said this color of sky was Carolina Blue, but I’m not sure if I should use that description here in Tennessee. On the other hand orange is the color of the University of Tennessee, so perhaps there wouldn’t be a problem. 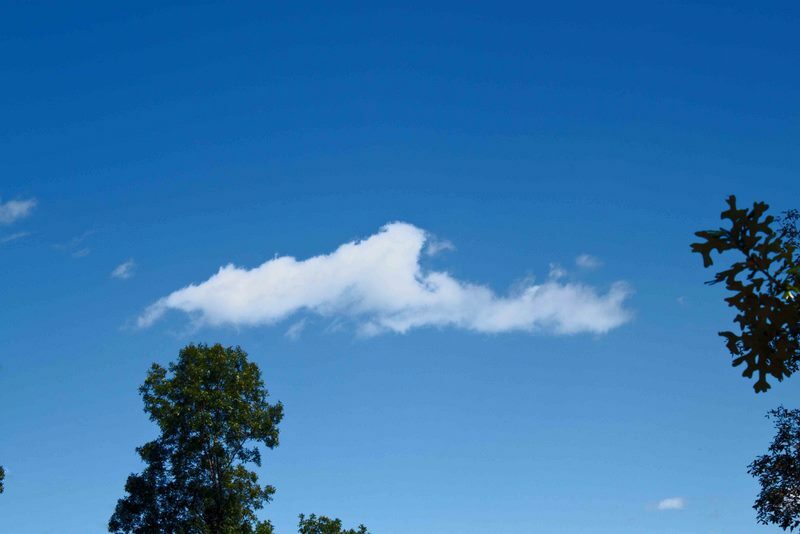 Every once in a while a small cloud will sail across Sunday’s blue sky. Fairfield Glade, Tennessee. September 12, 2001. But most of the time we just enjoyed that brilliant blue above the trees. Wood delivered to our house. September 15, 2010. In her blog Wednesday, Betsy told about the chimney sweep who came to give our chimney its annual cleaning. Yesterday the reason for needing our chimney cleaned was delivered. A dump truck dumped a load of firewood in our side yard. It seems strange that firewood was delivered on the hottest day we’ve had all week, but that’s the way it worked out. Now I’ll get to keep warm by stacking it. This is actually wood that we will burn next year. 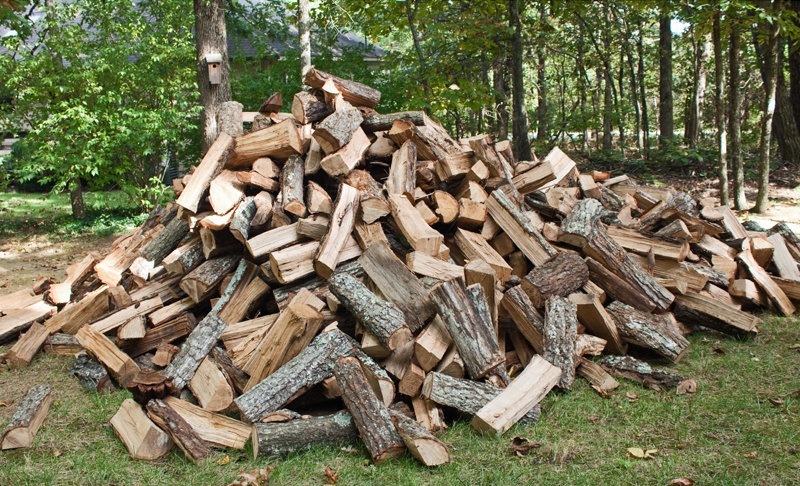 We purchase our wood a year in an advance so that we can season it and it will burn well. We do go through quite a bit of firewood each year. Our fireplace is in the Great Room and puts out enough heat to keep that room nice and toasty even on the coldest nights. 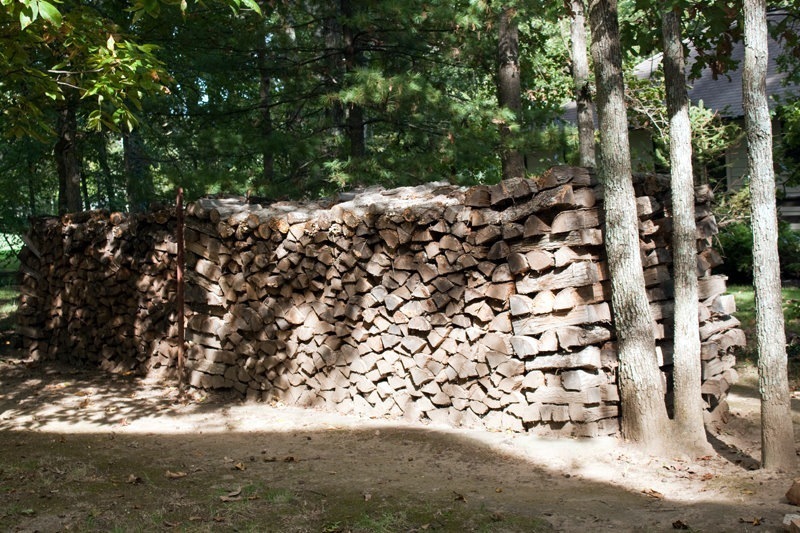 Wood that has been stacked and ready for use this year. September 15, 2010. The picture above shows our wood pile with the wood we will burn this year. I’ll have to split some of the thicker pieces so they will burn to the satisfaction of my Beautiful Bride, so this wood will warm me twice — once when I split it and once when I burn it. Oh, well, Betsy is happy that this wood will keep me out of trouble for a few days at least.